Lozere Costume of a Man. This is a print, in color, of a gentleman with a Royal Blue shirt and gray trousers, under the blue shirt is a white shirt with a black bow tie. He also has a black hat and smoking a pipe. Ideal for framing. In mint condition. Measures 12 1/2"long and 9 1/2 across. This is of heavy paper from a portfolio of a costume maker from before 1900, we are not sure of the exact date. 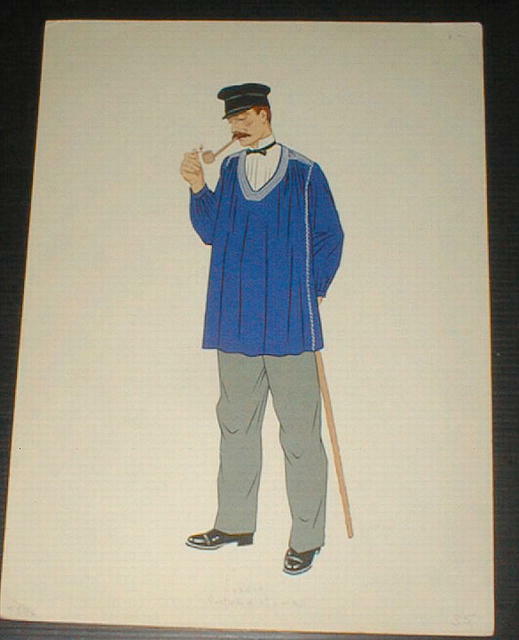 Items Similar To "Lozere Costume of a Man Color Print"